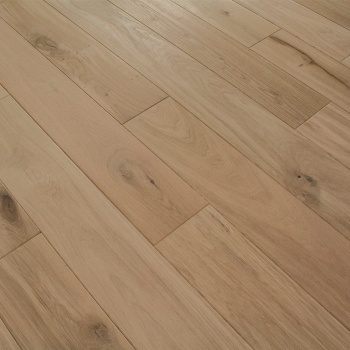 Our European Cottage Oak flooring is FSC certified and from a sustainable source. and is pre-filled and sanded, this is our best-selling product and provides exceptional value. Character Oak contains beautiful knots, some sap and colour variation. It can be laid in all one width or the more traditional random width and can be oiled, lacquered, or stained to achieve whatever look the customer desires. European Oak is widely acknowledged to have more depth and beauty to it than American Oak and the average lengths of our European Oak are generally double that of solid oak produced in the Far East. Lengths 800mm - 2400mm T&G all 4 sides, rustic (Bevelled or Unbevelled), 8-10% moisture content.